The latest installment of Fargo Friday. Tory Lanez continued his weekly rollout of new music today with a pair of releases. 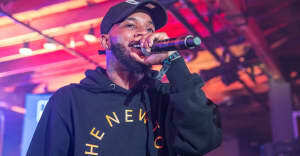 "For Real" came together with Droc and Lanez's frequent collaborator Play Picasso; "Unforgetful" incorporates a beat from London On Da Track. Both are a step away from the pop-friendly sound of "L.A. Confidential," which appeared in January. Listen below. Next month Lanez will perform at the Hot 97 Summer Jam.